Print Monkey » Giving Back…. I was asked last year, after doing some fundraising, to be a trustee of a local charity Alex’s Wish. The charity has been on my radar since it was created in 2010 by Emma & Andy Hallam (I know a bit confusing!). Their son Alex was diagnosed with Duchenne Muscular Dystrophy just after his third birthday. 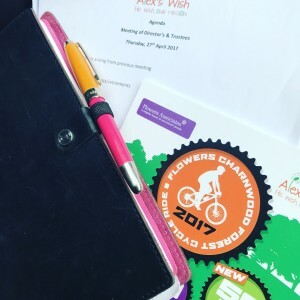 It’s a life limiting genetic condition, rather than wallow in self pity, Alex’s Wish was created to raise vital funds for research. Through the investment in clinical trials and research along with an alliance with other Duchenne charities, the charity believes that this generation of boys could be either the last to die or the first to survive – a really powerful thought! I was honoured to be asked to become a trustee. As part of my role, we help define the strategic direction of the charity and ensure good governance. 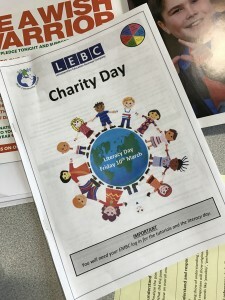 We can also get involved in a day to day capacity, hosting events, raising funds and just generally spreading the word, which I did recently at a secondary school in Leicester as part of their charity day. It’s a great opportunity for me in terms of personal development and a role I an throughly proud of.